It is generally agreed by stylists that of all the facial shapes, the round shape is the hardest to work with. Do not be disheartened on hearing this statement as the style game is not all over of you. Yes, you might have fewer options than guys with square faces, but some of the options that you have might even make them jealous. Before you start looking for Men’s Hairstyles for Round Faces, you need to determine whether you have a round face. A round face is one that has softer features and no prominent angles. The main key in looking for a hairstyle that suits a round face is getting something that adds volume to the hair while avoiding bulk. The volume adds more dimension to the face and gives it a more angular look that it needs. The parting, in this case, is always towards a certain side as the central parting add width to your face. You are also suggested not to keep the hair too long as even that adds width. The best way will be going for medium or short length of hair. They are also easier to handle and maintain, so that’s a big plus point for you. This hairstyle will take away the roundness of your face and give it a more defined look that you have always craved. Getting the style is really easy as well. You need to brush the hair up to give it volume and make a face look elongated. While getting the haircut done, ask your stylist to keep the sides of the hair in a shorter length than the central portion. It looks best on men who have brunette hair. You can keep a short stubble to go with it. It is a very popular version of the trendy fade hairstyle. In this look, you need to cut a clear parting on the right side of the hair. The Fading in hair length starts from the right of the parting. The rest of the hair is kept quite long, and it completely combed over to the other side. You can apply some hair gel to keep the hair set to the side that you have combed it over to. It is one of the coolest styles that you can try. The look is suited just perfectly for the parties and hangouts with friends. The length of the hair starts fading on the sides and the back so much so that the skin starts showing near the ears and nape. The middle part of the hair is where the real funkiness starts. You need to spike it upwards and keep it messy that way. You must try this if you are the proud owner of a head full of dark hair. The lure of the pompadour has been present among men since times immemorial. This is a vintage style that will never lose its charm, and it will effectively ensure that you look charming too. There is no parting needed for this look. The hair needs to be brushed on one side and puffed up to complete the hairstyle. Since the hair is high in volume and it gets raised up, it makes your face look less round than it actually is. If you are thinking that you are not young enough to carry off spiky hair, you are really wrong. The spikes can get tried at any age. The only difference that you can make is in the length of the spikes. You can keep it short if you think that long spikes are too daring for you. The central part of the hair is all spiked up in this look. You need two things for this one- some damn good hair styling products and a darn good hair stylist. This style has been tried by none other than our favorite actor Chris Hemsworth, aka superhero Thor. He has tried this style on his brunette hair but you can do this with dark hair too, and it will look equally amazing. The first thing that you need to do is get the hair cut in layers. The layers will add texture to your hair. So, this style will really be of use if you have thin hair. Just brush it casually with a thick-toothed comb, and you are ready. The hairstyle comes tried and tested by the much-loved Holly actor Zach Galifianakis. So, whether you are a fan of the actor or not, this look is a must try for how impeccably suited it is for all men who have round faces. Full beard hides the roundness of the face really well while the hairstyle adds that necessary element of panache. Make a parting on any side that you think suits your face and then comb the hair well on both sides of the parting. The young and fun vibe of the hairstyle is sure to make you fall for it. You need to try it to realize how good it can look on your round face. 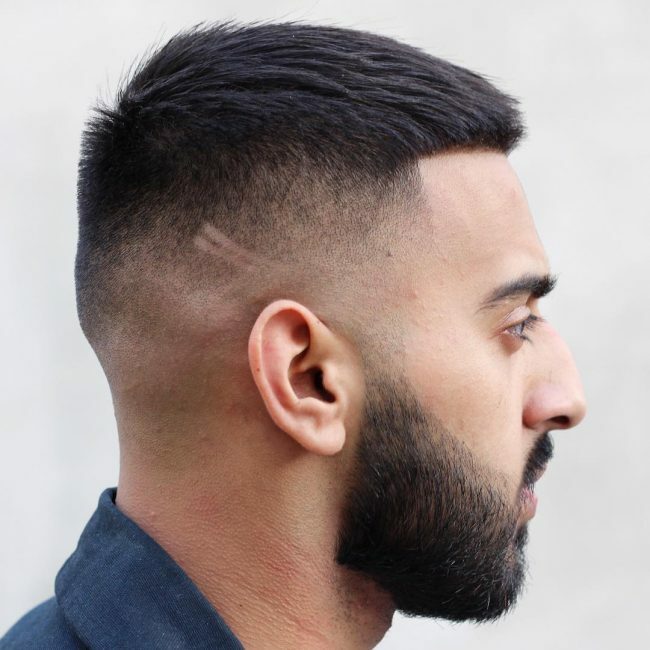 The best part of this style is that it is absolutely right for men who are not yet ready to go too daring with their haircuts. It is safe for office and great for parties- just what you look for in your ideal hairstyle. The front of the hair needs to be raised up, and rest of the hair is not made too well-brushed. 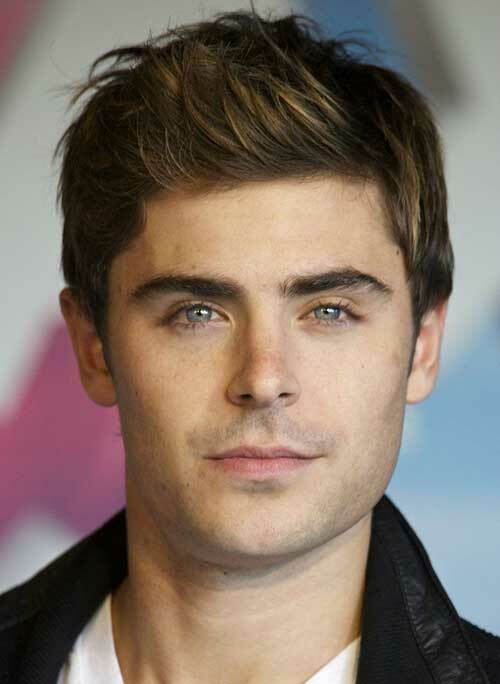 The heartthrob of millions, Zac Efron went for this look on certain occasions and you can do it too. If you are looking for a hairstyle that is high on fashion quotient but low on maintenance needs, then this one will fit just right with your needs. The hair is cut really short for this style and it is brushed frontwards. You can be someone who is always on the rush for the office and do not have too much time on hand to spend on perfecting the hairstyle in the morning. This look is ready within minutes and is totally hassle-free. The silky and shiny mane is the USP of this hairstyle and you need to sit with oodles of good hair styling to products to get this look. The hair is combed back from the center for the look. Do not apply too much pressure while combing it back and use a thick-toothed comb while brushing your hair as it needs to retain that puffed up look. It has a casual vibe about it that looks really stylish with tee-shirts and jackets. The spikes done on hair are a great way to take away the roundness of face while giving you a fashionable look. Here the spikes are not made in any one part of the hair. They are rather made all over the hair and the spikes do not even turn to the same direction. The result of this is a nice messy look that looks amazing with both shirts and tee-shirts. Men with any kind of hair color can go for this hairstyle. Wavy hair is truly a blessing for the versatility it offers in hair styling. It is more so for the men who have round faces as with proper styling, the attention is shifted to the hair rather than on the roundness of their face. For this look, comb your hair backwards and your style of the day is ready to be paired with your outfit of the day. Wear your favorite suit and go out with confidence with this hairstyle. The messiness and volume take away the focus from overt roundness of the face. The hair on the sides is cropped short while the central portion is kept long. It is raised upwards and messed up using your hair. You can add some light-colored highlights like blondes and light browns against the dark hue of your hair. If you are planning a relaxing vacation with your buddies, then this is the style that you can opt for. The singing sensation Zayn Malik is the one responsible for making this style a major hit among men. The hair is combed upwards to create a messy look in this hairstyle. You need to have medium length hair to carry off this style with ease. Let your shiny mane be an extension of your charming persona in this look. Wear a round or V-neck tee-shirt and you are ready to take on the world. The undercut is a style that needs no introduction to men. Most men who are into hair experiments have already tried this look or are willing to try this look. If you fall in the second category, then go for this hairstyle. You need to pump up the hair by adding enough volume to it. Ask your hair stylist to blow dry your hair if you are not sure about doing it yourself. Comb the hair back and you are set for the day with your new look. Carry it off with any outfit that you have decided to wear for the day.